Dr. Ann Collier talks with a patient. Research co-led by University of Washington pharmacy and medicine investigators has yielded a seven-day therapy for HIV. The therapy was successful in a macaque model. The findings were published in the March issue of the journal AIDS. Professors Rodney JY Ho of the School of Pharmacy and Ann Collier of the School of Medicine were lead authors; first author was Jake Kraft of the UW Department of Pharmaceutics. The "Targeted Long-Acting Combination Antiretroviral Therapy" (TLC-ART) team combined three HIV drugs: tenofovir, lopinavir and ritonavir. The scientists hoped that doing so would overcome drug insufficiency in lymph nodes. The drug cocktail, given to four macaques, had persistent levels lasting more than two weeks, a remarkable breakthrough. Currently HIV patients take multiple pills daily, which can pose challenges. 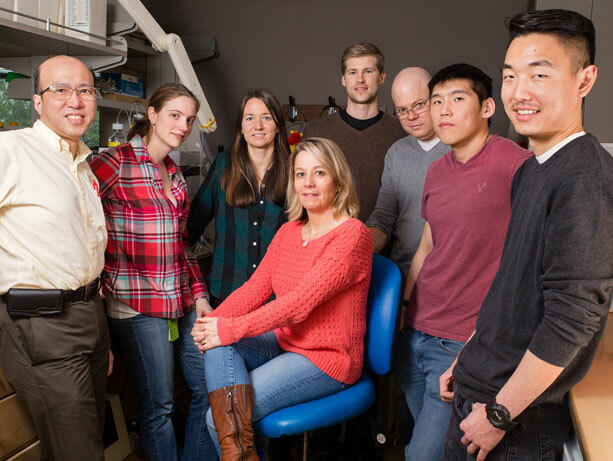 Other researchers on the team were Lisa McConnachie, Josefin Koehn, Loren Kinman, Carol Collins and Danny Shen. The team is pursuing innovative treatments to overcome limitations of current oral drug therapies. This study was sponsored by National Institutes of Health grant UM1 AI120176. See related story from 2015.